The American media has focused recently on the newly released Green New Deal (GND), a resolution sponsored by U.S. Rep. Alexandria Ocasio-Cortez and U.S. Sen. Ed Markey that would fundamentally transform America’s energy policy and move closer to their socialist vision for the country. As a resolution, the GND has no power to actually regulate or tax but gives left-leaning congressmen and potential presidential candidates a vehicle to virtue-signal their embrace of a radical, anti-fossil fuel agenda. One day before the much-ballyhooed release of the GND, and flying mostly under the radar, President Trump made an announcement that could have more of an effect on green energy than the Cortez-Markey proposal — and in the opposite direction. That was the president’s February 6 notice that he was nominating David Malpass to replace the outgoing World Bank president. Mr. Malpass, Treasury undersecretary for international affairs and former senior economic advisor for the Trump campaign, has been highly critical of the institution that he is now set to lead. The World Bank justifies funding of projects such as large renewable energy initiatives — detailed in their Climate Change Action Plan — with arguments that a shift away from fossil fuels benefits the poor through reduced air pollution. The bank states that it “joined the fight against climate change because it could push another 100 million people into poverty by 2030.” Their plan sets out “ambitious targets to be met by 2020, including helping client countries add 30 gigawatts of renewable energy.” In 2016 the bank announced it would spend 28% of investments on climate-related projects by 2020. The transition away from strictly targeting extreme poverty to becoming a climate change warrior began under the Clinton administration when then-President James Wolfensohn began turning the institution into a green funding source. Under Obama appointee Kim, the bank prioritized the closing of developing countries' coal mines over lifting the least fortunate out of generational poverty. 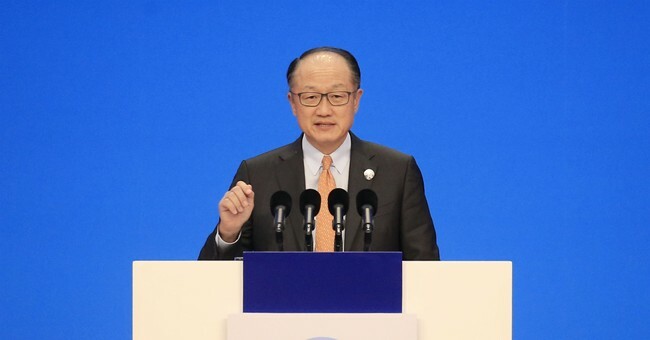 The World Bank aims to help the poverty-stricken, but in truth, it will be the poor who will most feel the burden of the policies the bank endorses. Backing of agreements like the Paris Climate Accord will reduce the availability of inexpensive, reliable energy that can increase prosperity for billions of the poorest. Nearly a billion people do not have the benefit of electricity and another billion have very limited access to the energy standards we take for granted in the western world. In addition, the living standards of all peoples benefit from inexpensive, dependable energy from fossil fuels. It is estimated that pollution from dirty, inefficient cooking and heating fuels, often dung, lead to about 4 million premature deaths a year. Policies such as that proposed by the World Bank condemn these unfortunates to more generations of poverty, disease and despair. Reliable, inexpensive energy is part of the solution which can lift billions of the impoverished out of systemic poverty and disease. Instead of promoting fruitless and harmful policies to control global temperature, the World Bank should embrace responsible investments that make energy and all its benefits more affordable, and thereby free the poor to rise out of poverty.